In 2016, the United Kingdom voted to leave the European Union. Three years later, the UK still faces confusion and uncertainty of their future. Hear what some prominent minds think of the Brexit situation, and its consequences. Photo credit: Czech Radio Plus. 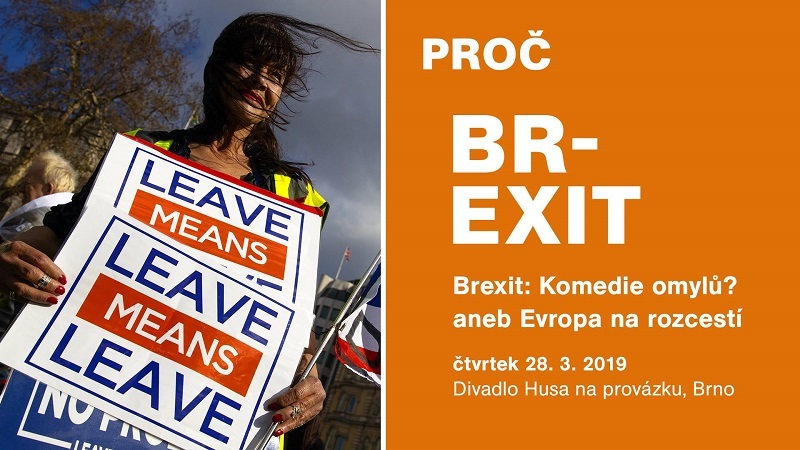 Brno, Mar 18 (BD) – On March 28, a public debate hosted by Czech Radio Plus (Český rozhlas Plus) named “Brexit: The Comedy of Errors? or Europe at a Crossroads” will take place in the Goose on a String Theatre. The debate will be in Czech language. You can watch and participate in the debate by asking questions to hear what some prominent minds think of the whole ordeal. As the audience, you will join the discussion. Not only will you be able to direct questions to the guests – you will also be voting to decide how the evening will look like. The guests for the public debate are the European Commissioner, Věra Jourová; ex-prime minister of the Czech Republic, Mirek Topolánek; professor of legal philosophy, Jiří Přibáň; the president of the Czech Confederation of Commerce and Tourism, Tomáš Prouza; and Czech economist, Pavel Kohout. The debate will be moderated by Michael Rozsypal of Czech Radio Plus. Attending the public debate is free of charge. There will also be a live broadcast on the Facebook page of Czech Radio Plus.